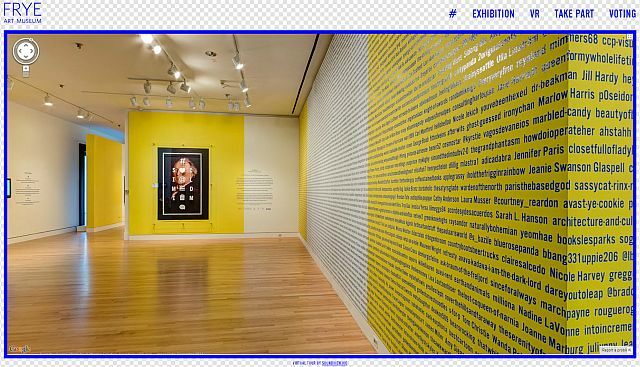 On Monday the Frye Art Museum in Seattle launched their virtual tour of the crowd-curated #socialmedium exhibit. The exhibit was crowd-curated by over 4000 people with votes on Facebook, Pinterest, Twitter, etc. and has received attention from the Huffington Post, Wall Street Journal, and most recently, the New York Times’ 36 Hours in Seattle piece. The tour, produced by Soundview360, allows guests from around the world to view the artworks without leaving their desks! I love that we were able to contribute to the Frye’s vision and the evolution of social media technology and the arts!